Create your own winter wonderland with Mary Berry's gingerbread recipe. It makes a wonderful centrepiece for parties, and children will love it. 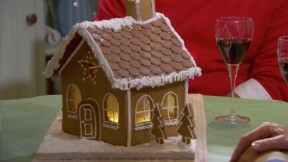 This gingerbread house recipe by Mary Berry is featured in the Season 2 Masterclass: Christmas episode. Melt the butter, sugar and syrup together in a large pan. Sieve the flour, bicarbonate of soda and ground ginger together into a large bowl and make a well in the center. Pour in the melted butter mixture, stir it in and, when cool enough to handle, knead to a stiff dough. Cut the pointed ends of the cocktail sticks into 1cm (½in) pieces (you should have 12 small pointed pieces). Push the blunt end of the cocktail stick pieces into the sloping edges of the front and back of the house, leaving the pointed ends sticking out to act as peg supports to attach the roof. (Remember to remove the sharp cocktail sticks from your gingerbread house before eating it, to avoid a choking hazard.) Pipe icing between the cocktail sticks and fix the two roof panels onto the house. Pipe icing around the base and edges of the chimney and attach to the roof.